Themed parties, quirky decor, gourmet food and candid photographs, these wedding planning groups will give you a Pinterest-worthy wedding. Signature welcome dinners, Bride’s Baraat, sunset weddings and after parties, from start to finish Veydaa will plan every event at your D-Day. If you want a unique party or a chic set design, you can count on them to understand your vision. 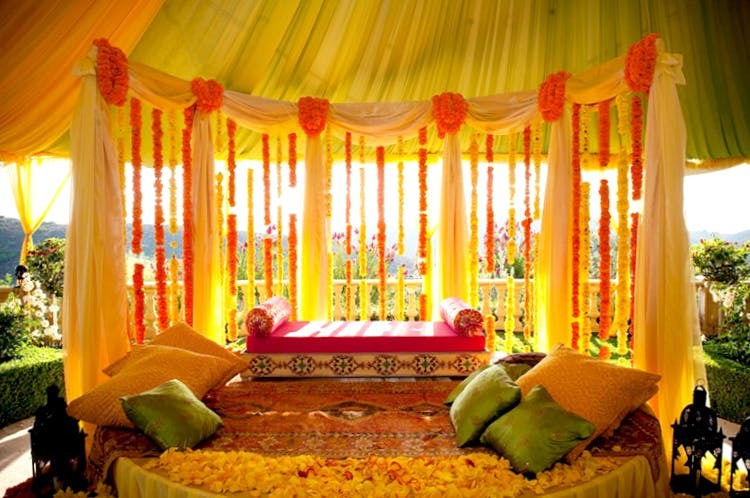 From light and sound to personal grooming, they have you covered for every wedding need. They operate in India and overseas (they’ve planned weddings in Bali and Dubai) and take care of the travel arrangements as well. Their starting price is 4 lakh with a fixed price for planning. They even have their own in-house decorator and other vendors so you don’t have to pull your hair out on your big day trying to coordinate everything. These guys are pros at planning weddings, having been in the business for over a decade. ‘Customised weddings for any budget’ is what Asapragus sells. Led by Pritam Datta who personally looks into the planning and execution of the wedding, they’ll give you the best offers on interior and exterior decorations, sound and lighting, cultural and entertainment and everything else you need to make your weddings the most memorable one going. They even have their own food catering service. If your budget is between 2.5 and 4 lakhs, give them a call. They charge a percent of the wedding cost. Big or small, if you’re up for a themed wedding then call them. Their personal stylist and designer will customise your wedding so that it is planned just as you imagined it. Because they are so hands-on, if a themed wedding is what you want, then these are your guys. Their attention to detail and focus on set design and décor make them a good option if you want a wedding that’s easy on the eyes. Starting at INR 4 lakhs, they charge a per cent of the wedding cost. Want to make a statement? Dynamic Events will give you an elaborate yet tasteful wedding. Their props for the photo booth are adorable – they have little signs that say ‘Still Single’ and ‘Joru Ka Gulaam’. They specialise in a ‘Varmala’ theme. Their experienced managers will meet you to understand your exact vision. Their services start at INR 2 lakhs and they have various packages depending on your requirements. Quirky and energetic, if you want a wedding that all your guests will remember for a long time to come, here are your go-to people. A floral decorated rickshaw instead of just a boring old photo booth, bicycles, fairy lights, Chinese lanterns, mini chalkboards with cute messages, umbrellas and bird cages are some of the innovative choices for decoration they go for. If nothing else, go for their out of the box ideas when it comes to décor – your wedding will surely be all over your guests Instagram feed! If you’re a bride addicted to Pinterest, look no further.